Surrounded by hype and in an unwavering spotlight, Jim Harbaugh is ready to rebuild Michigan football with his unique drive and motivation. This story appears in the May 18, 2015, issue of Sports Illustrated. Subscribe to the magazine here. 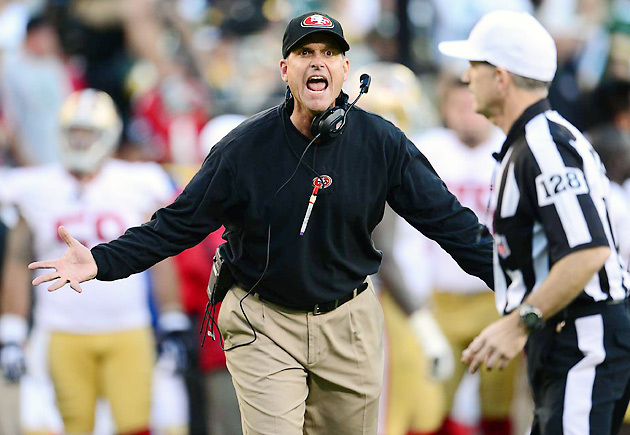 Two months after Jim Harbaugh decided to go home, he was living alone in a hotel. He missed more than his family while living there and working nonstop. He missed the fashion revolution on Michigan’s campus—all those kids, who weren’t even born when he played for Bo Schembechler in the 1980s, wearing his number 4 jersey, or his trademark khakis, or Harbaugh-themed T-shirts: Maize. Blue. Khaki. and Welcome Home, Coach and Ann Arbaugh. Harbaugh didn’t even see the Bank of Ann Arbor billboards: Like Jim loves khakis. We love to help. Each day he arrived at Schembechler Hall at 6 a.m., then returned to the Residence Inn by Briarwood Mall at 11:30 p.m. Then he would lay his sweater on one chair, belt and pants on another, keep his undershirt on, put on pajama bottoms, brush his teeth and go to bed. A model of efficiency: door to pillow in three minutes. Harbaugh arrived at Michigan after four successful years with the 49ers, where he went 44-19-1. He wooed his first recruit, six-year-old daughter Addie, out of Northern California by pointing to Michigan’s snow and ice and saying: “Anna and Elsa live here.” Those are the princesses from Disney’s Frozen. Addie committed on the spot. But finding a castle was not so simple. Jim’s wife, Sarah, had looked at 20 houses over several trips to Ann Arbor and hadn’t found one she loved. One Sunday, Harbaugh woke at 3 or 4 a.m. His mind was spinning. He got in his car and drove. It was one of those winter nights in the upper Midwest when visibility is low and even the snow looks dark. Harbaugh roamed for three hours, until sunlight woke the town and houses came into view. Sarah flew to Michigan and agreed. They bought it. There are more than 1,000 streets in Ann Arbor. Only later did Jim tell Sarah they would live on the one where Schembechler lived. Harbaugh, 51, is in his fifth month at Michigan, and it still feels like a dream. Not a schmaltzy, Disney fairy-tale sort of dream. It feels like an actual dream, vivid but incongruous, the kind where you imagine your long-deceased grandmother and your auto mechanic talking to your current boss and your first girlfriend, and you think they can’t all possibly be in the same place, but there they are. Col. Jim Minick retired in December after 26 years in the Marines, and he was planning to join the private sector when Harbaugh called. Now he is working for Wolverines football, and his official title doesn’t matter. Everybody calls him the Colonel. Harbaugh hired him not because they are buddies but because the Colonel possesses the qualities Harbaugh values most: He makes smart decisions, and he gets things done. The Colonel makes sure that every cone and every drill complies with NCAA regulations. When players kept leaving towels on the locker room floor, the Colonel suggested that for every time it happened, the whole team would run a gasser after practice. Towels are no longer left on the floor. Mostly, the Colonel makes sure that Harbaugh has the time, space and resources to do what the sign above his desk implores: "Just coach the team." Walk down the hall. You’ll see tight ends coach Jay Harbaugh, 25, the oldest of Jim’s six kids. Keep walking. There is Harbaugh’s new operations assistant, Erik Campbell, who made Jim’s biggest promise come true. 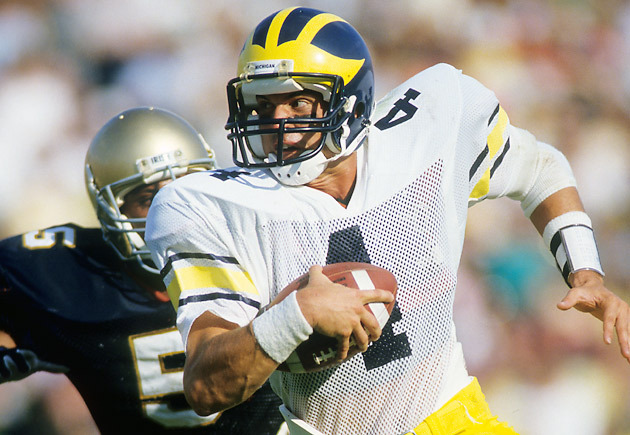 As a senior in 1986, Harbaugh guaranteed victory over Ohio State. Campbell, a defensive back, made a crucial tackle on Buckeyes receiver Cris Carter to seal it. There is Jim’s old quarterbacks coach Jerry Hanlon, long since retired, standing outside the office Schembechler kept until he died in 2006, lecturing Jim’s brother on blocking schemes. John Harbaugh, the Ravens’ coach, is visiting for a coaches’ clinic. And, Michigan students: If you think you’re in class with a freshman named Jim Harbaugh this fall, you’re not drunk. That’s Jim’s son. He was admitted a few weeks ago. Harbaugh’s third child, Grace, 14, remains in Southern California with her mom, Miah, Jim’s first wife, but his youngest children—Addie, four-year-old Kate and two-year-old Jack—will be running around while Michigan practices, just as Jim did as a kid, when his father, Jack, was the Wolverines’ defensive backs coach. And who is watching practice here on this mid-March day? John, Jack (the elder) and Jim’s mom, Jackie; Jim Hackett, the interim athletic director, who played for Michigan when Jack coached; Rick Leach, the quarterback Harbaugh mimicked as a child; assorted other former players... you could go on and on. And as Jim looks at all those faces, what does he think? There are too many people here, and they are too close to the field. Harbaugh stops practice and kicks most of them out. From the outside, so much of Harbaugh’s recent life seems packaged to get attention on Twitter. He is constantly in the news, even when his actions don’t meet any intelligent definition of news. He tweeted about his favorite TV show, Judge Judy, and people wrote about it. He brought in Jameis Winston and quarterback guru George Whitfield Jr. to help them prep for the combine (a savvy move, reminding recruits that Harbaugh is a quarterback guru himself), and got Winston to tell, on camera, another side of his infamous stolen-crab-legs story. When two women flipped a car in Ann Arbor, Harbaugh and the Colonel happened to be behind them, and they got out to help. Jay mentioned that his dad once ate cereal with Gatorade because he was out of milk. Michigan students tried it, put it on video and called it the Harbaugh Breakfast Challenge. When Michigan canceled a screening of the movie American Sniper amid protests, Harbaugh tweeted that his team would watch it regardless. Headline. The school quickly reversed course. Another headline. Michigan coaches will host camps around the country, taking their recruiting show on the road. SEC coaches, who are banned from doing that, complained. More headlines. Harbaugh told HBO’s Real Sports that football is “the last bastion of toughness in America in men,” which seemed unremarkable: a football coach defending football. But host Bryant Gumbel questioned the statement, and so conservative icon Rush Limbaugh said Gumbel “epitomizes the modern-day cultural left”... and another headline, this from the Detroit Free Press: Jim Harbaugh’s newest ally? Rush Limbaugh. Senior linebacker Joe Bolden says, “I’m sure if somebody saw him brushing his teeth, it would be all over Twitter and SportsCenter.” Actually, Harbaugh doesn’t even need to show up to create a stir. Fans regularly stop outside Schembechler Hall to take a picture in his parking spot. What would fans think if they sat in Jim’s office with the coach, his dad and his brother, and listened to stories for two hours? Like this one: Early in Jim’s four-year tenure at Stanford, Jack watched recruiting tape with the staff. Afterward, Jim had to drive to his eye doctor. In the car Jack kept saying he was recruiting too many 300-pound linemen and should find some more versatile players. Jim understood the point. But Jack kept going. Jim got irritated: “Is it O.K. to have some offensive linemen on the team?!? Is that O.K. ?” He was so annoyed he drove past his turn for the doctor’s office, and that really ticked him off. He and his dad stopped talking. They finally got to the doctor and leaned on the counter, at which point Jim reached over to his father and yanked out a few nose hairs. While Michigan students get ready to try the Harbaugh Nose-hair Challenge and post it on YouTube, understand: These are just stories. If you sat down with the man himself, you would probably find him approachable. People harp on Harbaugh’s eccentricities, but we all have eccentricities. He just doesn’t try hard to hide his. He doesn’t mind sitting down to chat with somebody in his office late at night with one sock on. Why does that stuff matter, anyway? Gatorade and cereal? Haven’t we all cobbled together a meal from what’s left in the cupboard and fridge? Then Harbaugh said, “So if your goal could just be to be zeroed out at death, have as many people that love you as don’t like you....” He laughed. This is not the goal, of course. But if it happens, so what? Just coach the team. You want a story? It won’t create a headline. In March, John Harbaugh addressed the Wolverines. John’s Ravens beat Jim’s 49ers 34–31 in Super Bowl XLVII. John talked about the time he and Jim were wrestling in the water and John thought he would drown. Then he dissected the emotions of postgame handshakes. Neither coach ever mentions the score, John said, “but he knows, and you know.” John demonstrated by shaking hands with a Michigan player. The players laughed. The easy conclusion is that Jim, a renowned competitor, never got over it. When Michigan came calling, NFL suitors also loomed. Many figured: Jim will never leave the NFL until he wins a Super Bowl like his brother. But they misunderstood the nature of John and Jim’s relationship—and Jim himself. More than beating each other, what Jim and John really want is to be close. That’s why John initially wanted his younger brother to stay in the NFL. He liked seeing him at league meetings and the combine. As he sat in Jim’s office, John’s phone rang. “It’s Ozzie,” he said, meaning Ravens general manager Ozzie Newsome. A year earlier John would have walked out of the room to hide Baltimore’s free-agency plans from the 49ers’ coach. This time he talked to Newsome right there, and after hanging up, he wanted Jim’s opinions: What do you think of him?... He’s a good backup, right? Football is not just the Harbaughs’ job and passion. It is their language, the nexus of their social lives and the backdrop for their favorite stories. John and Jim were never NFL rivals. But a piece of their relationship was missing, because they couldn’t talk freely about their teams. As for Jim, the notion that he needed a Super Bowl to satisfy his ego is misguided. Harbaugh does not live to win as much as he lives to compete. It’s an important distinction. As a child he treasured the certificates St. Francis gave out each year for perfect attendance. They represented something even more meaningful than achievement: relentless effort. When Harbaugh finds somebody who has worked so hard to perfect a craft, he gets as close as he can. He didn’t just sit next to the Michigan bench for a men’s basketball game; he chatted with coach John Beilein during the game. He didn’t just visit A’s spring training; he put on a uniform and coached first base. As a boy he thought the best job in the world, after he retired from coaching, would be working as the ball boy by the screen behind home plate at old Tiger Stadium, running after foul balls, because “you get to watch the game right there.” He still won’t rule it out. When he met Pulitzer Prize–winning photographer David Turnley in the parking lot one day, he invited Turnley to come to his office. Later, he showed the Wolverines a 60 Minutes feature about Turnley and his twin brother, Peter, also a photojournalist. The team gave Turnley a standing ovation, and now David is shooting a project called 365 Days of Michigan Football. What seems insane is actually quite calculated. People often ask Sarah what it’s like when Jim yells at her, and she tells them, “He’s never yelled at me.” She yells sometimes, but he doesn’t yell back. He just tells her the real reason she is mad, and he is usually right, and yes, that can be maddening. Sometimes it would be easier if he just yelled. But anybody can yell, and all that screaming on the sideline masks Harbaugh’s greatest skill: reading people. When he yells, it’s with a purpose. So, Jim, do you wear out your welcome? “I was thinking about Garth Brooks,” he says, then continues quoting the singer’s hit “Friends in Low Places”: Everything’s all right, I’ll just say good night, and I’ll show myself to the door. Sometimes it consumes him. Sometimes he conducts full conversations while he is alone in the shower. Sometimes the Harbaughs will be buckled into car seats, ready to leave, and Jim will sit at the wheel in a trance. Sarah tells him to stop thinking about football and start driving. He says that as much as he missed his family the last few months, there was a benefit: “You can work as much as you want to work.” Want, not have to. Most people get tired of working. Harbaugh doesn’t. Even his vacations are intense. Every year he goes on a mission to Peru—“face to face with poverty,” he says. He calls the experience “life-altering,” and there, too, Harbaugh finds people dedicated to their craft and becomes enamored. He keeps in contact with Archbishop Jose Antonio Eguren and other Peruvians. This spring, Michigan players who attended every off-season practice and meeting received certificates like young Jimmy used to bring home from St. Francis. (Any conflicts with class were excused absences.) He did the same thing in San Francisco. Harbaugh says that when he chose Michigan over an NFL job, he did not make a list of pros and cons. What would it look like, anyway? CON: Can’t win a Super Bowl. PRO: The first time my wife heard me cry was when Bo died. No, no. Harbaugh took the Wolverines job because he has wanted it since he was 10. A pro-and-cons list is not his style, anyway. He relies on intuition. His coaches discover quickly that he does not need three meetings to make one decision. If he thinks something will work, he does it. “Speeches?” Harbaugh says. “I don’t ever feel like I’m giving a speech. I don’t look at myself as a motivational speaker. Say what’s on your mind. Do you prepare for that? Yeah. You prepare those things.... Judge Judy says if you tell the truth, you don’t have to have a good memory.” He pauses. ​Five Michigan coaches have won national championships. Schembechler did not. Yet Schembechler is, by far, the most revered coach for reasons that go beyond his winning percentage (.796) or 13 Big Ten titles. He was the coach when programs meant something and coaches were considered molders of men. Schembechler’s players knew his rival, Ohio State’s Woody Hayes, was also his mentor, and that to love one coach was to understand the other. 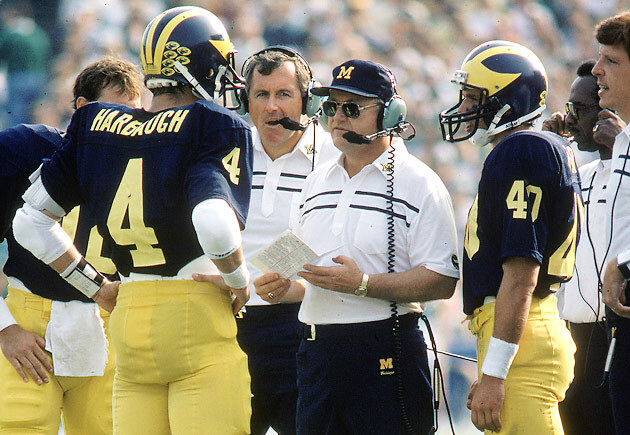 When Schembechler retired after the 1989 season, college football did not seem so much like the pros. Jackie Harbaugh was right: It’s not the same as when Jim was a kid. 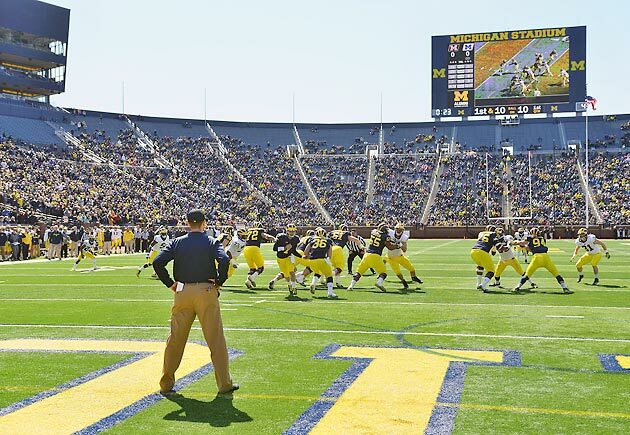 The sport is bigger, fans are more demanding, Michigan Stadium has luxury suites, and Harbaugh will be paid more in the first season of his seven-year, $40 million–plus deal than Schembechler was paid in his 21. Ann Arborites say their town is “28 square miles surrounded by reality.” But the Michigan football offices have been something of a reverse oasis: the one place in town where reality supersedes the hype. There, coaches have searched for a quarterback (already on the roster or not) and tried to figure out if their new health insurance had kicked in. They debated which assistant coach got sick first in January, passing the illness to almost everybody on the staff except the Colonel. (“He just wills it out of his body,” Harbaugh says.) By 9 a.m. on National Signing Day, his assistants were watching film of high school juniors. On campus students wear shirts with a lanyard, whistle and Sharpie printed on them; in Harbaugh’s office as many as six actual lanyards with whistles and Sharpies hang on a hook, ready for him to grab at any time. Consider this a warning: You may see Jim Harbaugh this summer, pulling out of a cheap hotel in a glorified rental-car van, sitting up high at the wheel. What can he say? He likes the view from there.